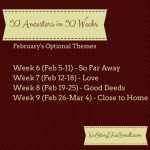 Posted in 52 Ancestors Challenge on February 26, 2014 by Amy Johnson Crow. This week, we had both the serious and the silly. Larry Sanburg told about his ancestor’s involvement with the Underground Railroad. Susie Reynolds shared how her great-great-grandparents met. Genohio isn’t quite her own grandpa, but she is related to herself. Cheryl Biermann Hartley wonders why her grand-uncle was wearing a dress. My contribution this week was about my great-great-grandfather George Skinner of Perry County, Ohio and why I’m glad he didn’t follow his siblings. AUTREY – “John Mabe Autrey” by Daniel Sample on Where Were They Then? BRYCE – “Margaret Maria Bryce” by Gail on Family History Etc. FEHER – “Vilma What? Feher? Schmidt? Furez?” by Joanne Clyde on Do You Know the Muffin Man? 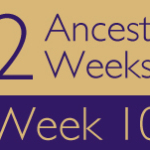 GOWER – “Nancy Gower” by Beth Gatlin on So Many Ancestors! JOLLETT – “James Jollett” by Wendy on Jollett Etc. MARSHALL – “Fr. Ed Resumes Parish Life” (Rev. Edmund P. Marshall) by purslandeforever on Who Were They? SCALETTI – “Antonino Rocco Scaletti, Prolific Sicilian Farmer” by Tim Graham on Photo Restorations by Tim G.
SPAIN – “Cyrus Spain” by Gail on Family History Etc. Amy, thanks for highlighting my post in your intro. I’m really having fun doing these weekly posts and am so glad I let you inspire me to do this! My family members are paying much more attention to my posts and I’m getting good feedback. Please keep up the good work with your recaps (it must be an incredible amount of work!) I always go through them and go to several (wish I had time to go to them all) posts. 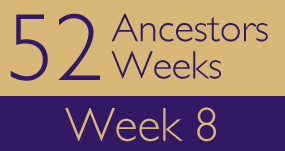 This has proven to be a great way to expand my connection with other family history buffs out there. I’m so glad that you’re enjoying the Challenge! When I started it, I had no dream of it becoming as popular as it has, nor did I anticipate what an impact it would have on my personal blogging. Like you, I’ve seen so many blogs that I hadn’t seen before and I’ve had interaction with family members that has been priceless. I’m so glad to hear that others are having a similar experience with it! I too am enjoying the Challenge. Thanks for mentioning the post about my grand-uncle and his dress. I told my cousin about the post and it led to a candid conversation about Uncle Will. My cousin grew up with him in Cincinnati. I, on the other hand, did not. I worked hard to be objective in my post, but my cousin said, in a respectful way, “If Uncle Will were alive today, I am sure he would have come out of the closet.” So now I know a lot more about Uncle Will than I did before. Cheryl — That’s great that you had that conversation with your cousin, and even better that it was candid. It’s often hard to bring up uncomfortable or awkward subjects. It’s neat, too, that you were able to gain some insight into your Uncle Will, beyond the conjecture. So many people don’t have that opportunity. 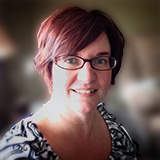 Thank you for featuring Aunt Janet’s tribute, Amy! Her memorial services are tonight and tomorrow, so I know the family appreciates letting Janet touch even more folks with her story. Amy, I’ve been enjoying this challenge too. 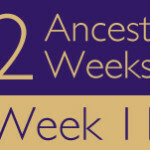 I’m using a different surname each week plus I’ve added an extra to the blog – pages showing a timeline for that surname. I’m hoping to make connections with other’s researching the same surname. Plus, it amazes me what type of information I have and how much of it is actually documented! I like your recaps of surnames – I go through it to see if anybody else may have my surnames. I too appreciate all the work you do in these recaps. Totally enjoying the 52 Challenge. It’s giving me the opportunity to put down all the family stories. I’ve been wanting to do it for sometime, but the challenge gave me the push that I needed. By the way I’ve posted another story to Skeletons In The Closet. this one is called The Baby Bonnet. Another blog is up on Skeletons In The Closet. It’s called A Girl’s Postcards. I managed to completely zone out and forgot to post week 8 (that is what happens when you take a couple of days off from work.) So I posted 8 and 9 last night. Thank you so much for doing this! It is really keeping me inspired!